The Far Side® is back with this much-anticipated three-volume slipcased paperback edition of The Complete Far Side! Originally published in hardcover in 2003, The Complete Far Side was obviously a New York Times bestseller. 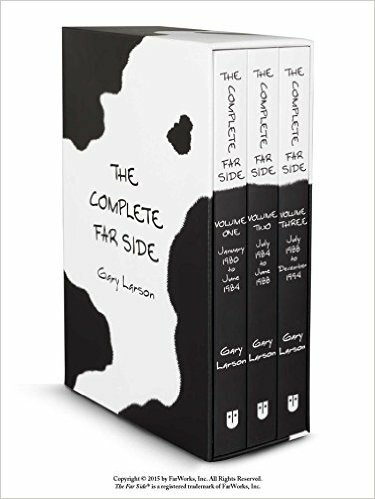 Now it’s back like a paperback set having a newly designed slipcase that can delight Far Side fans. Revered by its fans because funniest, most original, most “What the … ?”-inspiring cartoon ever, The Far Side® debuted in January 1980 and enjoyed an illustrious 14 years within the world’s comics pages until Gary Larson’s retirement in 1994. The Complete Far Side celebrates Larson’s twisted, irreverent genius in this particular ultimate Far Side book. This entry was posted in Comics & Graphic Novels and tagged The Complete Far Side. Originally published in hardcover in 2003, The Complete Far Side would have been a New York Times bestseller. Now it’s back like a paperback set which has a newly designed slipcase that could delight Far Side fans.